We’d love your help. Let us know what’s wrong with this preview of Yo Soy Muslim by Mark Gonzales. To ask other readers questions about Yo Soy Muslim, please sign up. This book is absolutely stunning. From the art to the message and everything in between. This book actually moved me to tears in a way a picture book hasn't in a LONG time. There was no doubt in my mind about buying this book for my collection. When I first saw it, I immediately recognized the art style, and knew it was by Mehrdokht Amini, the illustrator for Golden Domes and Silver Lanterns. There is a calming brilliance about her style, so I may buy everything she illustrates. While I gush about the art, the story is equally amazing. It is written as a letter from a father to his daughter (the author to his daughter, I assume), about her cultural and religious ide There was no doubt in my mind about buying this book for my collection. When I first saw it, I immediately recognized the art style, and knew it was by Mehrdokht Amini, the illustrator for Golden Domes and Silver Lanterns. There is a calming brilliance about her style, so I may buy everything she illustrates. A wonderful book that is all about the beauty of multiculturalism. The subtitle says it is a letter to the author's daughter, but it reads more like a poem. The illustrations are vivid and have nice details. We enjoyed this one. Stunning illustrations evocative of traditional Muslim art, wonderfully diverse people depicted. The story is easy, and poetic, and warming. This is a perfect story for a storytime, a bedtime, or an adult. Gorgeous verse, gorgeous illustrations and a heartfelt message. A must read. This a beautifully written story of a father’s letter to his young daughter about celebrating her multicultural diversity of being Latin and of the Muslim religion. I loved the use of the Spanish words “yo soy” which translates “I am” and finishing it with “Muslim.” The title captures the daughter’s multicultural diversity with just those three words. The father wants his daughter to be proud and celebrate her multicultural diversity and addresses the topic of how some people may negatively react This a beautifully written story of a father’s letter to his young daughter about celebrating her multicultural diversity of being Latin and of the Muslim religion. I loved the use of the Spanish words “yo soy” which translates “I am” and finishing it with “Muslim.” The title captures the daughter’s multicultural diversity with just those three words. This is a non-fiction short children’s book with a powerful message. There are a few Spanish words in the story but the book does not include a glossary. The book cover shows a loving little girl with her father. The illustrations interplay with the words in the story and captures the combination of the Hispanic culture and the Muslim culture at the same time. The daughter is wearing an orange, red and green with stripped leggings and crocs. The mother is dressed in a traditional hijabi and jilbab. The choice of vibrant colors matched the tone of the story on the pages. This book was written for children ages four to eight or pre-K through third grade. I can see a teacher using this book to start the discussions of what it means to be multicultural and how students should be proud and celebrate the diversity. This book can be used if the school has something like an “international day” where student’s celebrate their culture. Yo Soy Muslim is an incredibly touching read. The message of embracing your faith, your culture, your heritage even when others might put you down is a touching, powerful, important message. Children should always feel they can embrace every part of themselves and the world around them. This really hit me in my soft places and I couldn't stop smiling while reading it. This is my second day in a row reading a book illustrated by Mehrdokht Amini and I wish I could just read a new book illustrated Yo Soy Muslim is an incredibly touching read. The message of embracing your faith, your culture, your heritage even when others might put you down is a touching, powerful, important message. Children should always feel they can embrace every part of themselves and the world around them. This really hit me in my soft places and I couldn't stop smiling while reading it. This is my second day in a row reading a book illustrated by Mehrdokht Amini and I wish I could just read a new book illustrated by her every day. She is so talented and her style just takes my breath away. Although the illustrations were lovely and I'm excited for this topic to be represented, the poetry often felt too abstract to me - I often couldn't understand what the author's lines intended. In particular, I couldn't figure out the last few lines, which begin with the words "By those who dance with the wind" but whose reference point I couldn't parse - the previous stanza included a second-person command, "Say it with me," so I didn't follow the poetic segue to "By those who..." Many of the o Although the illustrations were lovely and I'm excited for this topic to be represented, the poetry often felt too abstract to me - I often couldn't understand what the author's lines intended. In particular, I couldn't figure out the last few lines, which begin with the words "By those who dance with the wind" but whose reference point I couldn't parse - the previous stanza included a second-person command, "Say it with me," so I didn't follow the poetic segue to "By those who..." Many of the other lines seemed random to me, eg. "Yo soy Muslim. Hummingbirds send blessings with their wings." Because... why? Why hummingbirds in particular? And the illustrations felt random sometimes too. "Yo soy Muslim": why horses in the surf? The poetic flavor never took shape for me. I was sorry the POV was grounded in defense: ie. people will be mean to you (presumably, although not spelled out, because you are Muslim? Because you are Hispanic Muslim?). But of course it's not an experience I've lived, so maybe that's a fair place to start, more explicit than simply saying Hold your head up and be proud of your heritage. Yo Soy Muslim: A Father’s Letter to His Daughter is a beautifully narrated letter from a father to his daughter growing up in a social context steeped in mistrust and xenophobia. This book is not an introduction to Islam. The elegant verse, originally inspired in part by the poem “Yo Soy Joaquin” written in 1969 by Chicano boxer, poet, and political activist Rodolfo “Corky” Gonzales, is a declaration of self and reclamation of identity. The simple yet powerful lyrical verse conveys a significant Yo Soy Muslim: A Father’s Letter to His Daughter is a beautifully narrated letter from a father to his daughter growing up in a social context steeped in mistrust and xenophobia. This book is not an introduction to Islam. The elegant verse, originally inspired in part by the poem “Yo Soy Joaquin” written in 1969 by Chicano boxer, poet, and political activist Rodolfo “Corky” Gonzales, is a declaration of self and reclamation of identity. This is a gorgeous book which I discovered in my local bookstore, searching for great children's books to recommend for the Multiracial community. With stunning, dreamlike illustrations and beautiful language, poignant and touching without being sentimental, I recommend this to anyone of any ethnicity looking to expand their child's view of the world while providing comfort and safety for children who have been asked the question, "What are you?" There are passing references to God, Allah, prayer This is a gorgeous book which I discovered in my local bookstore, searching for great children's books to recommend for the Multiracial community. With stunning, dreamlike illustrations and beautiful language, poignant and touching without being sentimental, I recommend this to anyone of any ethnicity looking to expand their child's view of the world while providing comfort and safety for children who have been asked the question, "What are you?" There are passing references to God, Allah, prayer, mosques, Abuelas and Mayan pyramids, all in a lyrical context that will have universal appeal. I couldn't resist buying it even though my children are in their teens and well beyond picture books. The descriptions and language in this book are to die for. Absolutely beautiful poetic language. And having more books to show children they are amazing and loved as they are is great. A lot of books featuring Muslims that I've come across have the darker reality, rather than just outwardly celebrating the beauty. This year, I've seen a few more books being just 100% positive an happy cultural celebrations, written by their own voices, and varying a little bit as different regions/countries show The descriptions and language in this book are to die for. Absolutely beautiful poetic language. The text of this book is nice, and emphasizes that young people should feel proud to be themselves. The illustrations were beautiful, richly colorful and reminiscent of artwork I saw in Latin America. The best part of this book is the vibrant expression of multiculturalism. This would make a nice gift for a young reader. Beautiful, lyrical "letter" telling his daughter to be proud of her Mexican, Muslim heritage. Interesting read. I do wonder how well this will do outside of Spanish/Muslim readers, but the art goes a long way here. A strong focus on pride and heritage do wonders here. I mean, those illustrations, those words. I can't get over how incredibly beautiful and inspirational this book is. This book is as spectacular as everyone says it is and then some. One of the sweetest books I've read in a long time. Absolutely beautiful. Beautifully written and illustrated. Review coming soon. On the other hand, the illustrations are quite lovely. Definitely the highlight of this picture book. LOVE the sweet message, the fusion of the Muslim faith with indigenous ancestors. The reason I gave it only 3 was that the words were so lyrical that they lacked coherence. The syntax was difficult to understand in a picture book format ... case and point the last sentence. It’s beautiful but incomplete, it’s just a dependent clause with a capital letter and a period. It detracts from the message (to me). Having said all that, I hope we continue to print books like this. It’s helpful to learn abo LOVE the sweet message, the fusion of the Muslim faith with indigenous ancestors. The reason I gave it only 3 was that the words were so lyrical that they lacked coherence. The syntax was difficult to understand in a picture book format ... case and point the last sentence. It’s beautiful but incomplete, it’s just a dependent clause with a capital letter and a period. It detracts from the message (to me). Hello, friends! 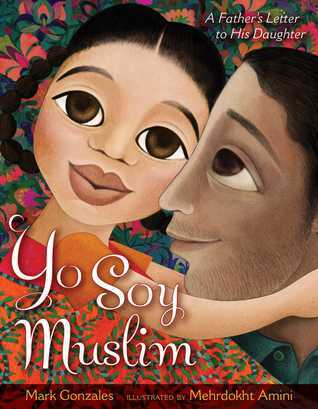 Our book today is Yo Soy Muslim: A Father’s Letter To His Daughter, written by Mark Gonzales and illustrated by Mehrdokht Amini, a powerful look at religious and racial tolerance through an intimately personal lens. Absolutely beautiful. Taking an exceptionally personal sentiment, the text and art weaves the father’s words to his daughter into a larger lesson about how we treat people who are “other” than us. Quiet, powerful language emphasizes the importance and value that ever child possesses, even as the world makes groups – especially children of those groups – feel small and powerless. The vibrant, strikingly colorful art fits this tone perfectly, drawing from both indigenous Latin American and Middle Eastern art to paint a world of explosive color. The length is great, and JJ and I both loved it. A gorgeous book to share with any little one to encourage understanding and pride, and for children of Latin and Muslim backgrounds, an astounding gift of representation. Baby Bookworm approved! Mark Gonzales is a poet and a distinguished Professor at the Institute for Diversity in the Arts at Stanford University. Born into a Roman Catholic Latino family in Mexico, he converted to Islam in his early twenties. He addresses this book to his daughter, in anticipation that she may [in fact, almost assuredly will] encounter hostility because of what she looks like and what she believes. “Yo soy Musli Mark Gonzales is a poet and a distinguished Professor at the Institute for Diversity in the Arts at Stanford University. Born into a Roman Catholic Latino family in Mexico, he converted to Islam in his early twenties. “Mi abuelo worked the fields. Illustrator Mehrdokht Amini uses colorful folk art collages to create imaginative pictures that will enchant readers. There are fantastical scenes as well as realistic ones, and depictions of diverse settings that convey the idea that Muslims are part of every culture. Yo Soy Muslim is a father's letter to his daughter and so falls into the category of poetry and verse. The father is writing to his daughter and tells her about her identity as a Muslim and does so in a beautiful manner. The characters are Laino and could be from Mexico or Central America because the Mayan pyramids are mentioned in the story. The father explains to his daughter that there will be times that you might have questions about the world and similarly the world will have questions abou Yo Soy Muslim is a father's letter to his daughter and so falls into the category of poetry and verse. The father is writing to his daughter and tells her about her identity as a Muslim and does so in a beautiful manner. The characters are Laino and could be from Mexico or Central America because the Mayan pyramids are mentioned in the story. The father explains to his daughter that there will be times that you might have questions about the world and similarly the world will have questions about you. The father tells his daughter that there will be times that people will ask questions such as “What are you and where are you from?” and there will also be times when they will not smile at you. He also tells her how she should respond in such situation, he tells his daughter to say Yo Soy Muslim. He then continues to tell her the amazing things her ancestors have done and the customs of being a Muslim. Most importantly he tells her to be proud of her heritage and to always smile. The book consists of realistic characters and situations, many Muslims are faced with similar situations where they have to explain who they are and this book does a beautiful work in answering these questions. The plot is rich and interesting, it includes different situations occurring at different places. The illustrations done by Mehrdokht Amini are exquisite with the pictures accurately portraying the words and the emotions of the page. The pages go from bright colors of the deserts to the dark of the night to the dull abandoned city. This book would be appropriate for children of ages 4 and up because of the simple language used. There is also diversity shown in the characters in the book and diversity within a group as well. When the author discusses Muslims the illustrator shows Muslims from different ethnic backgrounds and difference in clothing within the Muslim community. The characters in the book are good and lively, the fathers main advice is to always smile and dream which promotes a positive attitude even in times of hardship. There also seems to be no stereotype portrayed in this book which is one of the reasons I love it so much. I saw this book recommended lots of places -- including Minh Lê's "Best Picture Books of 2017" awarded this "Most Powerful" -- but I wasn't super into it. I mean, it's not bad, and yay for books about Spanish-speaking Muslims, I just wasn't blown away by it. The narrative is a ~poem from a father to his daughter, and while the poem grew on me on rereading, I also wondered if some of it makes it almost too mystical ("I speak Spanish, Arabic, and dreams. "), like there's no place for a child to jus I saw this book recommended lots of places -- including Minh Lê‏'s "Best Picture Books of 2017" awarded this "Most Powerful" -- but I wasn't super into it. I mean, it's not bad, and yay for books about Spanish-speaking Muslims, I just wasn't blown away by it. The narrative is a ~poem from a father to his daughter, and while the poem grew on me on rereading, I also wondered if some of it makes it almost too mystical ("I speak Spanish, Arabic, and dreams. "), like there's no place for a child to just be a regular kid, they have to live up to, "No matter what they say, know you are wondrous. A child of crescent moons, a builder of mosques, a descendant of brilliance, an ancestor in training." But it's true that when kids are getting really negative messages from people and systems around them, there's great value in telling them that they are from and for greatness. Mehrdokht Amini has illustrated other books I've found really beautiful ( Golden Domes and Silver Lanterns: A Muslim Book of Colors and Crescent Moons and Pointed Minarets: A Muslim Book of Shapes ), but I don't love the way she depicts faces. This is wonderfully beautiful! It's a proud, hopeful and honest letter from a Latino, Muslim father for his beautiful daughter. I can not recommend it enough! Yo Soy Muslim: A Fathers Letter to His Daughter is a great poetry book. This was a great book geared for younger children, specifically that were Muslim, to send positive messages about embracing your religion and culture. I actually read this book to my toddlers at work and they absolutely love it, I’ve had to renew it at the library a couple times in a row since I’ve checked it out. 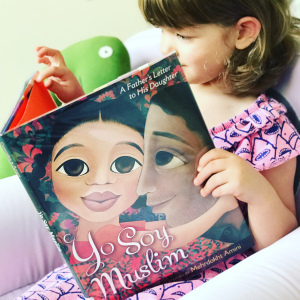 The book is illustrated beautifully and uses positive language and metaphors to help children understand the ide Yo Soy Muslim: A Fathers Letter to His Daughter is a great poetry book. This was a great book geared for younger children, specifically that were Muslim, to send positive messages about embracing your religion and culture. I actually read this book to my toddlers at work and they absolutely love it, I’ve had to renew it at the library a couple times in a row since I’ve checked it out. The book is illustrated beautifully and uses positive language and metaphors to help children understand the idea the author is trying to get across. My favorite lines in the book are “and there will come a day when some people in the world will not smile at you” and “Say it with me: Yo soy Muslim. our prayers were here before any borders were”. The book uses great word choice to explain things to children like the fact that everyone isn’t always going to be like you for who you are and that’s okay, you should always still embrace who you are and be proud of that which is why I gave it a 5 star rating. This book was published in August 2017, it is fairly new so it uses modern language and pictures but it also briefly touches on the characters family history/culture.